I've been waiting and waiting for the perfect packing snow all winter. Finally, it fell! So I borrowed the neighbor kids for sledding, snow-man (and -dog) building, and (their top choice) ornamental snow-cupcake creating. 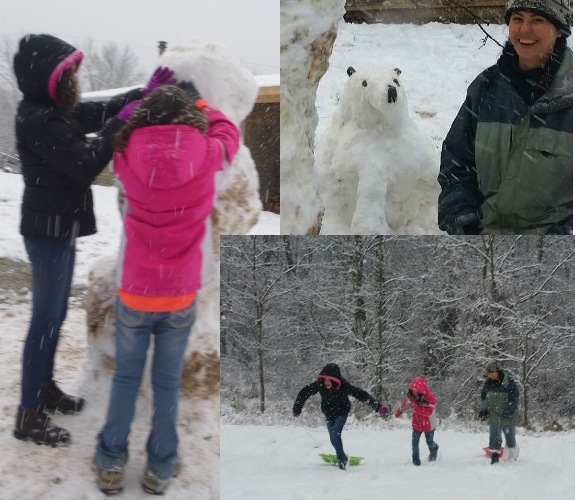 Despite being slightly derailed by a snowball fight, fun was had by all for the cheap price of a carrot (for a snow man) and a brownie (for the kid whose nose was hit by a snowball). By the way, I'd take a hit to the nose with a snowball for one of your brownies too! Wow you did get much more snow than we did. We had maybe 1/2 an inch. Looks like you had fun with the kids. And brownies yum. That looks awesome. Snow is great when you don't have anywhere to be, and when it's just the right type of snow it's even better!